I received three Disney Blu-ray films all on the same day for reviewing, The Sword in the Stone (50th Anniversary Edition), Robin Hood (40th Anniversary Edition), and Oliver and Company (25th Anniversary Edition), so I've been watching a bunch of Disney recently. And while I've seen all these movies at one time or another, it had been a while so it was nice to see them again. 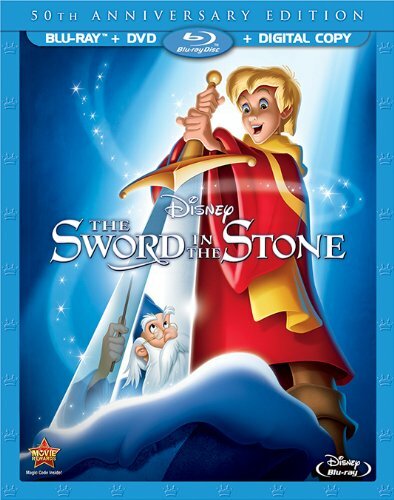 Of the three, the Sword in the Stone is the one I've seen most recently, back in 2008 when I reviewed the The Sword In The Stone - 45th Anniversary Edition. In fact, that review still applies to this release so there's no need to repeat it all here. Instead, I'll just focus on what's new to this release. The big thing here is the blu-ray, which looks beautiful. Like the other blu-ray releases, they definitely did some kind of restoration because the picture is so clean and crisp. I don't remember the 45th Anniversary Edition enough to give a comparison on the video quality, but I have no doubt that this blu-ray release is the best looking version of the film. And the audio is in 5.1 surround sound (it also includes 2.0 Dolby Surround) which is nice. The other thing I should mention is the extra features, as those are likely some differences from whatever was on the 45th Anniversary Edition. First is a never before seen alternate opening where Wart Meets Merlin, though this is just a storyboard not an actual animated sequence. It's about 4 minutes long and is kinda interesting to see. Then there's a featurette called Music Magic: The Sherman Brothers which is about 8 minutes long and involves the Sherman brothers talking about working on the film and some of the songs that didn't make it. I think this might have been on the previous DVD release as it seemed very familiar. Then there's a 7 minute long featurette called All About Magic where Walt Disney basically just shows some magic tricks... and I know I've seen this before, so it was probably on the 45th Anniversary Edition. Finally (if you don't count the sing-along) there are two classic animated shorts, Brave Little Tailor and A Knight for a Day. In the former, Mickey Mouse stars as an unexpected giant slayer to win Minnie's heart, and in the latter Goofy jousts a dragon to win Princess Esmeralda's heart. It's nice that both the shorts stayed within the fantasy theme. I know I've seen both of these as well, though I couldn't tell you if it was because they were on the 45th Anniversary Edition or if it was just from TV. This is not one of my favorite Disney movies by a long shot, but the colorful visuals may keep young children entertained. Again, for a review about the actual film, please see my The Sword In The Stone - 45th Anniversary Edition review. If you already own that version, then I'd say you probably will have no need of this version unless you're a blu-ray completist. And if you've never seen the movie, then definitely rent it first.